Today after harvesting broccoli in the Dome I remembered a recipe I had seen in Fresh Duck Eggs Daily by Lisa Steele that I can’t wait to bake up. I may have to use chicken eggs if I can’t find duck eggs locally… I really want to raise my own ducks after learning more from Lisa on a recent interview. 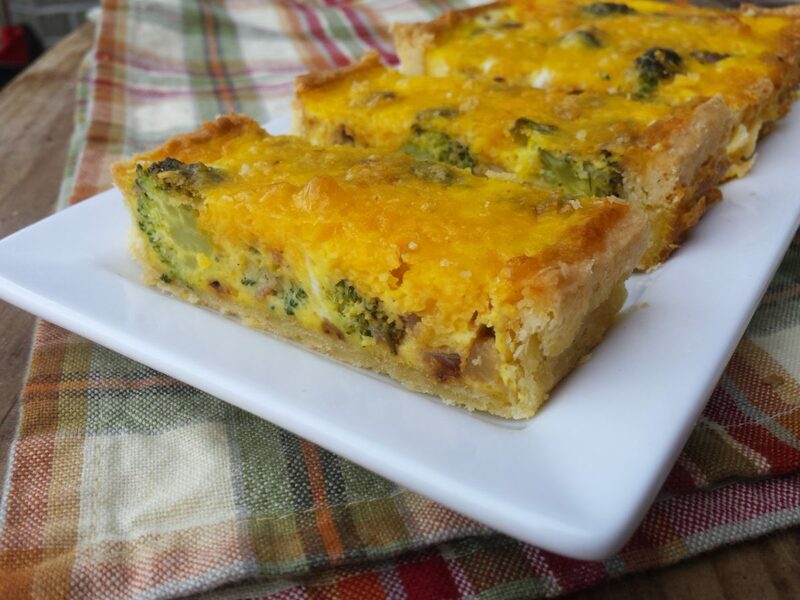 I’m sure after making this Broccoli Cheddar Tart I will want my own ducks even more. Lisa Steele likes to use Pate Brisee crust for this tart, but you can substitute your favorite crust recipe or use a store bought crust. To blind bake, I chill for at least 30 minutes once I’ve rolled out the dough and have it in the pan. I prick the bottom, then line it with parchment and pie weights and bake the crust at 400 degrees for 20-30 minutes until it is lightly browned and nearly done. Then remove from the oven and let cool; reducing the oven temperature to 325 degrees. Cook the sausage until browned and crispy in a cast iron skillet. Remove and roast the broccoli, onion and garlic in the same pan over high heat until crispy and browned. Whisk the eggs and heavy cream, season with salt, pepper and nutmeg. Toss together the shredded cheese and flour. Arrange the broccoli mixture in the tart pan, cover with the cheese and then carefully pour the egg mixture over the top. Bake for 20-30 minutes until just set. Cover the crust with foil,if necessary, to prevent over browning. Remove from the oven, cut into slices or wedges and serve warm or at room temperature. One of my favorite books I keep out on the table in the great room so Little Helper ( AKA my 4 year old Niece) and I can read every time she visits. Author Lisa Steele is the real deal when it comes to raising poultry. We are fans of her first book, “Fresh Eggs Daily,” which is about raising chickens naturally. Her new book is just as adorable and a valuable guide to raising ducks for eggs and just to enjoy as a part of the family. Perhaps my favorite thing about the book besides the adorable photos is all the recipes featuring duck eggs. I want to raise my own ducks just so I can make the recipes! Order your copy of Ducks Eggs Daily today! [alert-announce]Do you cook with duck eggs? I’d love to hear about where you find your eggs and your opinion on raising them in your backyard or farm. Please connect with me by commenting below.